Our gift to you for joining us? A list of 10 tools that will smooth the way you do business, saving you time, money and energy. 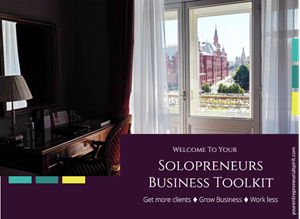 The Business Toolkit is guaranteed produce time saving results even if you only adopt one solution! Success! Now check your email to confirm your subscription. To make sure you don't miss out on future mailings, add us to your address book or move the first email to your Primary Inbox (for Gmail users).